This Scripture Candy Gable Gift Box Case features Soft Peppermints . 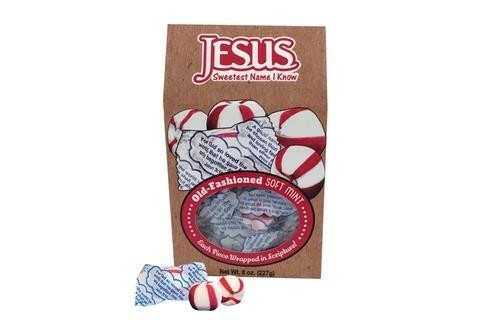 This Scripture Candy "Jesus Sweetest Name I Know" themed gable box contains 8 oz. of delicious, old fashioned, melt-in-your-mouth soft peppermints. Each Scripture Candy Gable box features a scripture on the back and a hidden message on the inside flap. Each individual piece of candy is wrapped in a scripture wrapper. With the "To" and "From" printed at the top of the package, this would be perfect for gift giving. 8oz. of old-fashioned soft peppermints.